Traditional traffic calming can only be implemented on local and collector roads. Some other safety measures, such as bike lanes, can be added to arterial roads and by narrowing the road, will also slow down traffic. Traffic calming is the deliberate slowing of traffic in residential areas. Engineering changes to roadways such as adding speed humps, roundabouts, or narrowing lanes have been proven to slow traffic and reduce collisions. These improvements can be even more effective at improving road safety when combined with lower speed limits. Traffic calming can take place on a single street, or across a larger neighbourhood. 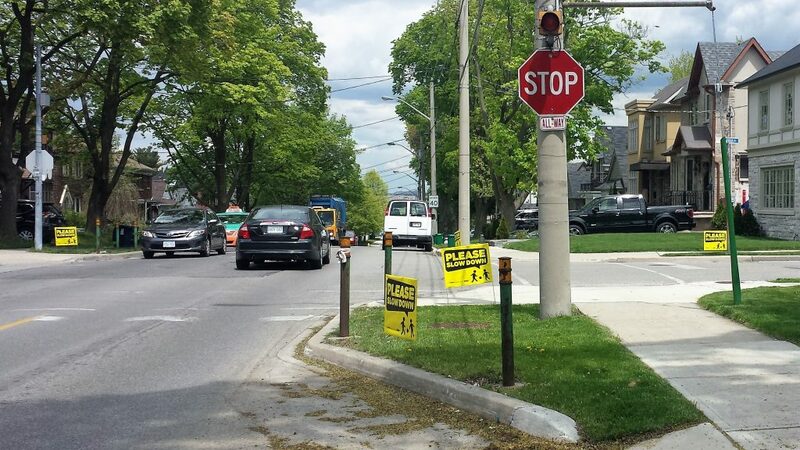 Begin by consulting with your Ward Councillor, who can help you with the early stages of this process, and whose support will be important to the success of any local traffic calming initiative. • Community consultation requirements through a community petition or a public meeting (hosted by your Councillor). • Safety requirements such as the presence of sidewalks and impact on emergency vehicles. • Technical requirements such as speed and volume of traffic, minimum block length, and impact on transit. Safety and technical analysis are undertaken by City staff. Proposals that meet all the criteria are subject to polling conducted by the City Clerkʼs Office. The poll must have over 50% of affected households respond and at least 60% of households should be in favour. To help you get started, we’ve created a list of Traditional Traffic Calming Treatments, as well as Other Safety Measures that can also be used to narrow the road and slow traffic speeds. The City of Toronto has also recently produced the Traffic Calming Guide For Toronto to provide an overview of different traffic calming measures, their impacts, and the processes to have them installed. In addition to speaking with your Councillor it may be appropriate to call 311.